Germany’s interior minister says the person arrested after last night’s lorry attack in Berlin has denied involvement. Meanwhile the capital’s police chief has said it’s not clear if the detained man is the driver of the truck which ploughed into a crowded Christmas market, killing 12 people and wounding nearly 50. The Interior Minister Thomas de Maizière said the suspect probably came from Pakistan and that his asylum application had not been completed. “One person was arrested following the events of last night. He is denying any involvement in what happened. Our investigation is continuing in a transparent way,” he told a news conference. The minister added that the suspect was not on any terrorist database. There has been no claim of responsibility. 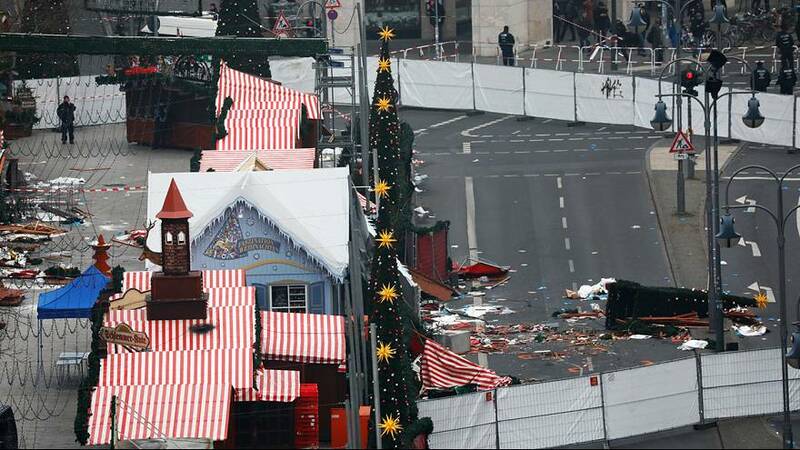 Some 18 of the injured are in a serious condition, de Maizière said. Given the suspect’s denial, the authorities have urged people to be alert. As Berlin and Germany mourn, flags are flying at half mast. Elsewhere in Germany seasonal events remain open. But Christmas markets in the capital are closed on Tuesday. When they re-open, the authorities say security will be significantly stepped up. Measures will include police on patrol with machine guns and barriers erected at the entrances to events.